For other uses, see A320 (disambiguation). The Airbus A320 family consists of short- to medium-range, narrow-body, commercial passenger twin-engine jet airliners manufactured by Airbus. The family includes the A318, A319, A320 and A321, as well as the ACJ business jet. The A320s are also named A320ceo (current engine option) following the introduction of the A320neo (new engine option). The aircraft family can accommodate up to 236 passengers and has a range of 3,100 to 12,000 km (1,700 to 6,500 nmi), depending on model. The first member of the A320 family—the A320—was launched in March 1984, first flew on 22 February 1987, and was first delivered in March 1988 to launch customer Air France. The family was extended to include the A321 (first delivered 1994), the A319 (1996), and the A318 (2003). The A320 family pioneered the use of digital fly-by-wire flight control systems, as well as side-stick controls, in commercial aircraft. There has been a continuous improvement process since introduction. Final assembly of the family takes place in Toulouse, France, and Hamburg, Germany. A plant in Tianjin, China, has also been producing aircraft for Chinese airlines since 2009, while a final assembly facility in Mobile, Alabama, United States, delivered its first A321 in April 2016. As of 31 December 2018, a total of 8,605 Airbus A320-family aircraft have been delivered, of which 8,217 are in service. In addition, another 6,056 airliners are on firm order. It ranked as the world's fastest-selling jet airliner family according to records from 2005 to 2007, and as the best-selling single-generation aircraft programme. The A320 family has proved popular with airlines including low-cost carriers such as EasyJet, which ordered A319s and A320s to replace its ageing 737 fleet. As of December 2018, American Airlines was the largest operator of the Airbus A320 family aircraft, operating 397 aircraft. [b] The aircraft family competes directly with the 737 and has competed with the 717, 757, and the MD-80/MD-90. In December 2010, Airbus announced a new generation of the A320 family, the A320neo (new engine option). The A320neo offers new, more efficient engines, combined with airframe improvements and the addition of winglets, named Sharklets by Airbus. The aircraft will deliver fuel savings of up to 15%. As of December 2018, a total of 6,526 A320neo family aircraft had been ordered by more than 70 airlines, making it the fastest selling commercial aircraft. The first A320neo was delivered to Lufthansa on 20 January 2016 and it entered service on 25 January 2016. When Airbus designed the Airbus A300 during the late 1960s and early 1970s, it envisaged a broad family of airliners with which to compete against Boeing and Douglas, two established US aerospace manufacturers. From the moment of formation, Airbus had begun studies into derivatives of the Airbus A300B in support of this long-term goal. Prior to the service introduction of the first Airbus airliners, engineers within Airbus had identified nine possible variations of the A300 known as A300B1 to B9. A 10th variation, conceived in 1973, later the first to be constructed, was designated the A300B10. It was a smaller aircraft which would be developed into the long-range Airbus A310. Airbus then focused its efforts on the single-aisle market, which was dominated by the 737 and McDonnell Douglas DC-9. Plans from a number of European aircraft manufacturers called for a successor to the relatively successful BAC One-Eleven, and to replace the 737–200 and DC-9. Germany's MBB (Messerschmitt-Bölkow-Blohm), British Aircraft Corporation, Sweden's Saab and Spain's CASA worked on the EUROPLANE, a 180- to 200-seat aircraft. It was abandoned after intruding on A310 specifications. VFW-Fokker, Dornier and Hawker Siddeley worked on a number of 150-seat designs. Alongside BAe (which at the time was not part of Airbus) were MBB, Fokker-VFW and Aérospatiale. The design within the JET study that was carried forward was the JET2 (163 passengers), which then became the Airbus S.A1/2/3 series (Single Aisle), before settling on the A320 name for its launch in 1984. Previously, Hawker Siddeley had produced a design called the HS.134 "Airbus" in 1965, an evolution of the HS.121 (formerly DH.121) Trident, which shared much of the general arrangement of the later JET3 study design. The name "Airbus" at the time referred to a BEA requirement, rather than to the later international programme. In June 1977 was set up a new Joint European Transport (JET) programme. It was based at the then British Aerospace (formerly Vickers) site in Weybridge, Surrey, UK. Although the members were all of Airbus' partners, they regarded the project as a separate collaboration from Airbus. This project was considered the forerunner of Airbus A320, encompassing the 130- to 188-seat market, powered by two CFM56s. It would have a cruise speed of Mach 0.84 (faster than Boeing 737). The programme was later transferred to Airbus, leading up to the creation of the Single-Aisle (SA) studies in 1980, led by former leader of JET programme, Derek Brown. The group looked at three different variants, covering the 125- to 180-seat market, called SA1, SA2 and SA3. Although unaware at the time, the consortium was producing the blueprints for the A319, A320 and A321, respectively. The single-aisle programme created divisions within Airbus about whether to design a shorter-range twinjet rather than a longer-range quadjet wanted by the West Germans, particularly Lufthansa. However, works proceeded, and the German carrier would eventually order the twinjet. In February 1981, the project was re-designated A320, with efforts focused on the former SA2. During the year, Airbus worked with Delta Air Lines on a 150-seat aircraft envisioned and required by the airline. The A320 would carry 150 passengers over 2,850 or 1,860 nmi (5,280 or 3,440 km) using fuel from wing fuel tanks only. The Dash 200 had centre tank activated, increasing fuel capacity from 15,590 to 23,430 L (3,429 to 5,154 imp gal). They would measure 36.04 and 39.24 m (118 ft 3 in and 128 ft 9 in), respectively. Airbus considered a fuselage diameter of "the Boeing 707 and 727, or do something better" and settled on a wider cross-section with a 3.7 m (12 ft 2 in) internal width, compared to Boeing's 3.45 m (11 ft 4 in). Although heavier, this allowed to compete more effectively with the 737. The A320 wing went through several stages of design, finally settling on 33.91 m (111 ft 3 in). The UK, France and West Germany wanted the responsibility of final assembly and the associated duties, known as "work-share arguments". The Germans requested an increased work-share of 40%, while the British wanted the major responsibilities to be swapped around to give partners production and research and development experience. In the end, British work-share was increased from that of the two previous Airbuses. France was willing to commit to a launch aid, or subsidies, while the Germans were more cautious. The UK government was unwilling to provide funding for the tooling requested by British Aerospace (BAe) and estimated at ₤250 million, it was postponed for three years. On 1 March 1984 the government and the manufacturer agreed that ₤50 million would be paid whether the A320 would fly or not, while the rest would be paid as a levy on each aircraft sold. During the A320 development programme, Airbus considered propfan technology, backed by Lufthansa. At the time unproven, it was essentially a fan placed outside the engine nacelle, offering speed of a turbofan at turboprops economics; eventually, Airbus stuck with turbofans. Power on the A320 would be supplied by two CFM56-5-A1s rated at 25,000 lbf (111.2 kN). It was the only available engine at launch until the IAE V2500, offered by International Aero Engines, a group composed of Rolls-Royce plc, Pratt & Whitney, Japanese Aero Engine Corporation, Fiat and MTU. The first V2500 variant, the V2500-A1, has a thrust output of 25,000 pounds-force (110 kN), hence the name. It is 4% more efficient than the CFM56, with cruise thrust specific fuel consumption for the -A5 at 0.574 and 0.596 lb/lbf/h (16.3 and 16.9 g/kN/s) for the CFM56-5A1. In presence of then French Prime Minister Jacques Chirac and the Prince and Princess of Wales, the first A320 was rolled out of the final assembly line on 14 February 1987 and made its maiden flight on 22 February in 3 hours and 23 minutes from Toulouse. The flight test programme took 1,200 hours on 530 flights, European Joint Aviation Authorities certification was delivered on 26 February 1988.:50 The first A320 was delivered to Air France on 28 March 1988. The first derivative of the A320 was the Airbus A321, also known as the Stretched A320, A320-500 and A325. Its launch came on 24 November 1988 after commitments for 183 aircraft from 10 customers were secured. The aircraft would be a minimum-changed derivative, apart from a number of minor modifications to the wing, and the fuselage stretch itself. The wing would incorporate double-slotted flaps and minor trailing edge modifications, increasing the wing area from 124 m2 (1,330 sq ft) to 128 m2 (1,380 sq ft). The fuselage was lengthened by four plugs (two ahead and two behind the wings), giving the A321 an overall length of 6.94 metres (22 ft 9 in) longer than the A320. The length increase required the overwing exits of the A320 to be enlarged and repositioned in front of and behind the wings. The centre fuselage and undercarriage were reinforced to accommodate the increase in maximum takeoff weight of 9,600 kg (21,200 lb), taking it to 83,000 kg (183,000 lb). Final assembly for the A321 would be, as a first for any Airbus, carried out in Germany (then West Germany). This came after a dispute between the French, who claimed the move would incur $150 million (€135 million) in unnecessary expenditure associated with the new plant, and the Germans, arguing it would be more productive for Airbus in the long run. The second production line was located at Hamburg, which would also subsequently produce the smaller Airbus A319 and A318. For the first time, Airbus entered the bond market, through which it raised $480 million (€475 million) to finance development costs. An additional $180 million (€175 million) was borrowed from European Investment Bank and private investors. The maiden flight of the Airbus A321 came on 11 March 1993, when the prototype, registration F-WWIA, flew with IAE V2500 engines; the second prototype, equipped with CFM56-5B turbofans, flew in May. Lufthansa and Alitalia were the first to order the stretched Airbuses, with 20 and 40 aircraft requested, respectively. The first of Lufthansa's V2500-A5-powered A321s arrived on 27 January 1994, while Alitalia received its first CFM56-5B-powered aircraft on 22 March. The A319 is the next derivative of the baseline A320. The design is a "shrink" with its origins in the 130- to 140-seat SA1, part of the Single-Aisle studies. The SA1 was shelved as the consortium concentrated on its bigger siblings. After healthy sales of the A320/A321, Airbus re-focused on what was then known as the A320M-7, meaning A320 minus seven fuselage frames. It would provide direct competition for the 737–300/-700. The shrink was achieved through the removal of four fuselage frames fore and three aft of the wing, cutting the overall length by 3.73 metres (12 ft 3 in). Consequently, the number of overwing exits was reduced from four to two. The bulk-cargo door was replaced by an aft container door, which can take in reduced height LD3-45 containers. Minor software changes were made to accommodate the different handling characteristics; otherwise the aircraft is largely unchanged. Power is provided by the CFM56-5A or V2500-A5, derated to 98 kN (22,000 lbf), with option for 105 kN (24,000 lbf) thrust. Airbus began offering the new model from 22 May 1992, with the actual launch of the $275 million (€250 million) programme occurring on 10 June 1993; the A319's first customer was ILFC, who signed for six aircraft. On 23 March 1995, the first A319 underwent final assembly at Airbus' German plant in Hamburg, where the A321s are also assembled. It was rolled out on 24 August 1995, with the maiden flight the following day. The certification programme would take 350 airborne hours involving two aircraft; certification for the CFM56-5B6/2-equipped variant was granted in April 1996, after which qualification for the V2524-A5 started the following month. Delivery of the first A319, to Swissair, took place on 25 April 1996, entering service by month's end. In January 1997, an A319 broke a record during a delivery flight by flying 3,588 nautical miles (6,645 km) the great circle route to Winnipeg, Manitoba from Hamburg, in 9 hours 5 minutes. The A319 has proved popular with low-cost airlines such as EasyJet, who has orders for 172, with 172 delivered. The A318 was born out of mid-1990 studies between Aviation Industries of China (AVIC), Singapore Technologies Aerospace, Alenia and Airbus on a 95- to 125-seat aircraft project. The programme was called the AE31X, and covered the 95-seat AE316 and 115- to 125-seat AE317. The former would have had an overall length of 31.3 m (102 ft 8 in), while the AE317 was longer by 3.2 m (10 ft 6 in), at 34.5 m (113 ft 2 in). The engines were to be supplied from two Rolls-Royce BR715s, CFM56-9s, or the Pratt & Whitney PW6000s; with the MTOW of 53.3 t (118,000 lb) for the smaller version and 58 t (128,000 lb) for the AE317, the thrust requirement were 77.9–84.6 kN (17,500–19,000 lbf) and 84.6–91.2 kN (19,000–20,500 lbf), respectively. Range was settled at 5,200 km (2,800 nmi) and 5,800 km (3,100 nmi) for the high gross weights of both variants. Both share a wingspan of 31.0 m (101 ft 8 in) and a flight deck similar to that of the A320 family. Costing $2 billion (€1.85 billion) to develop, aircraft production to take place in China. Simultaneously, Airbus was developing Airbus A318. In early 1998, Airbus revealed its considerations of designing a 100-seat aircraft based on the A320. The AE31X project was terminated by September 1998, after which Airbus officially announced an aircraft of its own, the A318, at that year's Farnborough Airshow. The aircraft is the smallest product of Airbus's product range, and was developed coincidentally at the same time as the largest commercial aircraft in history, the Airbus A380. First called A319M5 in as early as March 1995, it was shorter by 0.79-metre (2 ft 7 in) ahead of the wing and 1.6 metres (5 ft 3 in) behind. These cuts reduced passenger capacity from 124 on the A319 to 107 passengers in a two-class layout. Range was 5,700 kilometres (3,100 nmi), or 5,950 kilometres (3,210 nmi) with upcoming Sharklets. The 107-seater was launched on 26 April 1999 with the options and orders count at 109 aircraft. After three years of design, the maiden flight took place at Hamburg on 15 January 2002. Tests on the lead engine, the Pratt & Whitney PW6000, revealed worse-than-expected fuel consumption. Consequently, Pratt & Whitney abandoned the five-stage high pressure compressor (HPC) for the MTU-designed six-stage HPC. The 129 order book for the A318 shrunk to 80 largely because of switches to other A320 family members. After 17 months of flight certification, during which 850 hours and 350 flights were accumulated, JAA certification was obtained for the CFM56-powered variant on 23 May 2003. On 22 July 2003, first delivery for launch customer Frontier Airlines occurred, entering service before the end of the month. 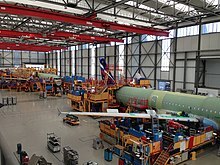 The Toulouse Blagnac final assembly line builds A320s, whereas the Hamburg Finkenwerder final assembly line builds A318s, A319s, and A321s. The Airbus factory in Tianjin, China assembles A319s, A320s, and A321s; A320s and A321s are also assembled at the Airbus Americas factory in Mobile, Alabama. Airbus produced a total of 42 A320s per month in 2015, and expects to increase to 50 per month in 2017. As Airbus targets a 60 monthly global production rate by mid-2019, the Tianjin line delivered 51 in 2016 and it could assemble six per month from four as it starts producing A320neos in 2017; 147 Airbus were delivered in 2016 in China, 20% of its production, mostly A320-family, a 47% market share as the country should become the world's largest market ahead of the US before 2027. In June 2018, along a larger and modernised delivery centre, Airbus inaugurated its fourth Hamburg production line, with two seven-axis robots to drill 80% of fuselage upper side holes, autonomous mobile tooling platforms and following Design Thinking principles. By January 2019, Mobile was outputting 4.5 A320s per month, raising to five by the end of the year. In 2006, Airbus started the A320 Enhanced (A320E) programme as a series of improvements targeting a 4–5% efficiency gain with large winglets (2%), aerodynamic refinements (1%), weight savings and a new aircraft cabin. Engine improvements reducing fuel consumption by 1% were fitted into the A320 in 2007 with the CFM56 Tech Insertion and in 2008 with the V2500Select (One). 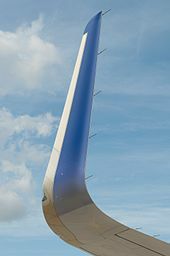 In 2006, Airbus tested three styles of winglet intended to counteract the wing's induced drag and wingtip vortices more effectively than the previous wingtip fence. The first design type to be tested was developed by Airbus and was based on work done by the AWIATOR programme. The second type of winglet incorporated a more blended design and was designed by Winglet Technology, a company based in Wichita, Kansas. Two aircraft were used in the flight test evaluation campaign – the prototype A320, which had been retained by Airbus for testing, and a new build aircraft which was fitted with both types of winglets before it was delivered to JetBlue. Despite the anticipated efficiency gains and development work, Airbus announced that the new winglets will not be offered to customers, claiming that the weight of the modifications required would negate any aerodynamic benefits. On 17 December 2008, Airbus announced it was to begin flight testing an existing blended winglet design developed by Aviation Partners Inc. as part of an A320 modernisation programme using the A320 prototype. Airbus launched the sharklet blended wingtip device during the November 2009 Dubai Airshow: installation adds 200 kg (440 lb) but offers a 3.5% fuel burn reduction on flights over 2,800 km (1,500 nmi). They save US$220,000 and 700 t of CO2 per aircraft per year. The 2.5 metres (8 ft 2 in) tall devices are manufactured by Korean Air Aerospace Division. The winglets increase efficiency by decreasing lift-induced drag. In December 2011, Airbus filed suit in the western district of Texas over Aviation Partners' claims of infringement of its patents on winglet design and construction which were granted in 1993. Airbus' lawsuit seeks to reject responsibility to pay royalties to Aviation Partners for using its designs, despite work performed together with both parties to develop advanced winglets for the A320neo. The first Sharklet-equipped A320 was delivered to AirAsia on 21 December 2012, offering a 450 kg (990 lb) payload increase or 100 nmi (190 km) longer range at the original payload. In 2007, Airbus introduced a new enhanced, quieter cabin with better luggage storage and a more modern look and feel, and a new galley reduces weight, increase revenue space and improves ergonomics and design for food hygiene and recycling. It offers a new air purifier with filters and a catalytic converter removing unpleasant smells from the air before it is pumped into the cabin and LEDs for ambience lighting and PSU. Offering 10% more overhead bin volume, more shoulder room, a weight reduction, a new intercom and in-flight entertainment system, noise reduction and slimmer PSU, the enhanced Cabin can be retrofitted. The flight crew controls the cabin through touchscreen displays. The A320neo (neo for new engine option) is a development launched on 1 December 2010, it made its first flight on 25 September 2014 and it was introduced by Lufthansa on 25 January 2016. Re-engined with CFM International LEAP-1A or Pratt & Whitney PW1000G engines and with large sharklets, it should be 15% more fuel efficient. Three variants are based on the previous A319, A320 and A321. Airbus received 6,031 orders by March 2018 and delivered 318 by May 2018. The original family is renamed A320ceo, for current engine option. The Airbus A320 family are narrow-body (single-aisle) aircraft with a retractable tricycle landing gear and are powered by two wing pylon-mounted turbofan engines. After the oil price rises of the 1970s, Airbus needed to minimise the trip fuel costs of the A320. To that end, it adopted composite primary structures, centre-of-gravity control using fuel, glass cockpit (EFIS) and a two-crew flight deck. 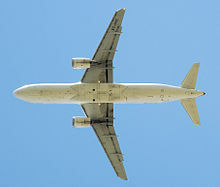 Airbus claimed the 737-300 burns 35% more fuel and has a 16% higher operating cost per seat than the V2500-powered A320. A 150-seat A320 burns 11,608 kg (25,591 lb) of jet fuel over 2,151 nmi (3,984 km) (between Los Angeles and New York City), or 2.43 L/100 km (97 mpg‑US) per seat with a 0.8 kg/L fuel. Its wing is long and thin, offering better aerodynamic efficiency because of the higher aspect ratio than the competing 737 and MD-80. The Airbus A320 family are low-wing cantilever monoplanes with a conventional empennage with a single vertical stabilizer and rudder. Its wing sweep is 25 degrees. Compared to other airliners of the same class, the A320 features a wider single-aisle cabin of 3.95 metres (156 in) outside diameter, compared to 3.8 m (148 in) of the Boeing 737 or 757, and larger overhead bins. Its cargo hold can accommodate Unit Load Devices containers. The A320 airframe includes composite materials and aluminium alloys to save weight and reduce the total number of parts to decrease the maintenance costs. Its tail assembly is made almost entirely of such composites by CASA, who also builds the elevators, main landing gear doors, and rear fuselage parts. It includes a full glass cockpit rather than the hybrid versions found in previous airliners. The A320's flight deck is equipped with Electronic Flight Instrument System (EFIS) with side-stick controllers. The A320 features an Electronic Centralised Aircraft Monitor (ECAM) which gives the flight crew information about all the systems of the aircraft. The only analogue instruments were the Radio-magnetic indicator and brake pressure indicator. From 2003, A320's feature liquid crystal display (LCD) units in the flight deck of its A318, A319, A320, and A321 flight decks instead of the original cathode ray tube (CRT) displays. These include the main displays and the backup artificial horizon, which was an analog display prior to this. Airbus offers an avionics upgrade for older A320, the In-Service Enhancement Package, to keep them updated. Digital head-up displays are available. The A320 retained the dark cockpit (where an indicator is off when its system is running; useful for drawing attention to dysfunctions when an indicator is lit) from the A310, the first widebody designed to be operated without a flight engineer and influenced by Bernard Ziegler, first Airbus CEO Henri Ziegler's son. All following Airbuses have similar human/machine interface and systems control philosophy to facilitate cross-type qualification with minimal training; for Roger Béteille, former Airbus president, this choice was one of the most difficult he had ever made. The A320 is the world's first airliner with digital fly-by-wire (FBW) flight control system: input commands through the side-stick are interpreted by flight control computers and transmitted to flight control surfaces within the flight envelope protection; in the 1980s the computer-controlled dynamic system of the Dassault Mirage 2000 fighter cross-fertilised the Airbus team which tested FBW on an A300. At its introduction, fly-by-wire and flight envelope protection was a new experience for many pilots. Early A320s used the Intel 80186 and Motorola 68010. In 1988, the flight management computer contained six Intel 80286 CPUs, running in three logical pairs, with 2.5 megabytes of memory. The suppliers providing turbofan engines for the A320 series are CFM International with the CFM56, International Aero Engines offering its V2500, and Pratt & Whitney's PW6000 engines available only for the A318. The Joint Aviation Authorities (JAA) issued the type certificate for the A320 on 26 February 1988. After entering the market in March 1988 with Air France and Ansett Australia, Airbus then expanded the A320 family rapidly, launching the 185-seat A321 in 1989 and first delivered it in 1994; launching the 124-seat A319 in 1993 and delivering it in 1996; and launching the 107-seat A318 in 1999 with first deliveries in 2003. The A320 family was developed to compete with the 737 Classics (-300/-400/-500) and the McDonnell Douglas MD-80/90 series, and has since faced challenges from the Boeing 737 Next Generation (-600/-700/-800/-900) and the 717 during its two decades in service. As of 2010, as well as the 737, the A320 family faces competition from Embraer's E-195 (to the A318), and the CSeries being developed by Bombardier to the A318/A319. Airbus has delivered 8,605 A320 series aircraft since their certification/first delivery in early 1988, with another 6,056 on firm order (as of 31 December 2018). In comparison, Boeing has shipped 10,444 737s since late 1967, with 8,918 of those deliveries since March 1988, and has a further 4,763 on firm order (as of 31 December 2018). By September 2018, there were 7,251 A320 family ceo aircraft in service versus 6,757 737NGs, while Airbus should deliver 3,174 A320neos compared with 2,999 Boeing 737 MAX through 2022. Airbus sold well the A320 to low-cost startups and offering a choice of engines could make them more attractive to airlines and lessors than the single sourced 737, but CFM engines are extremely reliable. The six month head-start of the A320neo allowed Airbus to rack up 1,000 orders before Boeing announced the MAX. The A321 has outsold the 737-900 three to one, as the A321neo is again dominating the 737-9 MAX, to be joined by the 737-10 MAX. A Checks are every 750 flight hours and structural inspections are at six- and 12-year intervals. Airbus was studying a future replacement for the A320 series, tentatively dubbed NSR, for "New Short-Range aircraft". The follow-on aircraft to replace the A320 was named A3XX. Airbus North America President Barry Eccleston states that the earliest the aircraft could be available is 2017. In January 2010, John Leahy, Airbus's chief operating officer-customers, stated that an all-new single-aisle aircraft is unlikely to be constructed before 2024/2025. For the Airbus A320neo or New Engine Option variants, see Airbus A320neo family § Variants. The baseline A320 has given rise to a family of aircraft which share a common design but with passenger capacity ranges from 100, on the A318, to 220, on the A321. They compete with the 737, 757, and 717. Because the four variants share the same flight deck, all have the same pilot type rating. Today all variants are available as corporate jets. An A319 variant known as A319LR is also developed. Military version like A319 MPA also exists. American Airlines is the world's largest airline operator of the A320 family of aircraft with 392 aircraft in service as of 30 September 2017. Technically, the name "A320" only refers to the original mid-sized aircraft, but it is often informally used to indicate any of the A318/A319/A320/A321 family. All variants are able to be ETOPS (Extended-range Twin-engine Operational Performance Standards) certified for 180 minutes since 2004 (EASA) and 2006 (FAA). With launch of the new Airbus A320neo project, the previous members of the Airbus A320 family received the "current engine option" or "CEO" name. The A320 series has two variants, the A320-100 and A320-200. Only 21 A320-100s were produced. These aircraft, the first to be manufactured, were delivered to Air Inter – later acquired by Air France – and British Airways as a result of an order from British Caledonian made prior to its acquisition. The primary changes of the -200 over the -100 are wingtip fences and increased fuel capacity for increased range. Indian Airlines used its first 31 A320-200s with double-bogie main landing gear for airfields with poor runway condition which a single-bogie main gear could not manage. Powered by two CFM International CFM56-5s or IAE V2500s with thrust ratings of 98–120 kN (22,000–27,000 lbf), its typical range with 150 passengers is 3,300 nmi / 6,100 km. A total of 4,512 of the A320ceo model have been delivered, with 220 remaining on order as of 30 September 2017. The closest Boeing competitor is the 737-800. 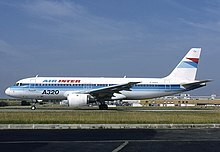 In 1988, the value of a new A320 was $30 million, reaching $40 million by the end of the 1990s, a 30% increase lower than the inflation, it dipped to $37 million after 2001, then peaked to $47 million in 2008, and stabilised at $40-42 million until the transition to the A320neo. As the A320 began operations in 1988, the A321 was launched as its first derivative. The A321 fuselage is stretched by 6.93 metres (22 ft 9 in) with a 4.27 m (14 ft 0 in) front plug immediately forward of wing and a 2.67 m (8 ft 9 in) rear plug. The A321-100 maximum takeoff weight is increased by 9,600 kg (21,200 lb) to 83,000 kg (183,000 lb). To maintain performance, double-slotted flaps were included, in addition to increasing the wing area by 4 m2 (43 sq ft), to 128 m2 (1,380 sq ft). The maiden flight of the first of two prototypes came on 11 March 1993. The A321-100 entered service in January 1994 with Lufthansa. As the A321-100 range was reduced compared to the A320, the heavier and longer range A321-200 development was launched in 1995. This is achieved through higher thrust engines (V2533-A5 or CFM56-5B3), minor structural strengthening, and an increase in fuel capacity with the installation of one or two optional 2,990 L (790 US gal) tanks in the rear underfloor hold. Its fuel capacity is increased to 30,030 L (7,930 US gal) and its maximum takeoff weight to 93,000 kg (205,000 lb). It first flew in December 1996 and entered service with Monarch Airlines in April 1997. Its closest Boeing competitors are the 737-900/900ER, and the 757–200. A total of 1,562 of the A321ceo model have been delivered, with 231 remaining on order as of 30 September 2017. The A319 is a shortened, minimum-change version of the A320. Also known as the A320M-7, it is 3.73 metres (12 ft 3 in) shorter than the A320; four frames fore of the wing and three frames aft of the wing were removed. The reduced seating reduces the emergency exits to six. With virtually the same fuel capacity as the A320-200, and fewer passengers, the range with 124 passengers in a two-class configuration extends to 6,650 km (3,590 nmi), or 6,850 km (3,700 nmi) with the "Sharklets". Four propulsion options available on the A319 are the 23,040-pound-force (102.5 kN) V2522-A5 and 24,800-pound-force (110 kN) V2527M-A5 from IAE, or the 22,000-pound-force (98 kN) CFM56-5B/A and 27,000-pound-force (120 kN) CFM56-5B7. Although identical to those of the A320, these engines are derated because of the A319's lower MTOW. The A319 was developed at the request of Steven Udvar-Hazy, the former president and CEO of ILFC according to The New York Times. The A319's launch customer, in fact, was ILFC, which had placed an order for six A319s by 1993. Anticipating further orders by Swissair and Alitalia, Airbus decided to launch the programme on 10 June 1993. Final assembly of the first A319 began on 23 March 1995 and it was first introduced with Swissair in April 1996. The direct Boeing competitor is the Boeing 737-700. A total of 1,460 of the A319ceo model have been delivered, with 24 remaining on order as of 30 September 2017. A 1998 A319 value was $35 million new, was halved by 2009 and reached scrap levels by 2019. The A319CJ (rebranded ACJ319) is the corporate jet version of the A319. It incorporates removable extra fuel tanks (up to 6 Additional Center Tanks) which are installed in the cargo compartment, and an increased service ceiling of 12,500 m (41,000 ft). Range with eight passengers' payload and auxiliary fuel tanks (ACTs) is up to 6,000 nautical miles (11,000 km). Upon resale, the aircraft can be reconfigured as a standard A319 by removing its extra tanks and corporate cabin outfit, thus maximising its resale value. It was formerly also known as the ACJ, or Airbus Corporate Jet, while starting with 2014 it has the marketing designation ACJ319. The aircraft seats up to 39 passengers, but may be outfitted by the customers into any configuration. Tyrolean Jet Service Mfg. GmbH & CO KG, MJET and Reliance Industries are among its users. The A319CJ competes with other ultralarge-cabin corporate jets such as the Boeing 737–700-based Boeing Business Jet (BBJ) and Embraer Lineage 1000, as well as with large-cabin and ultralong-range Gulfstream G650, Gulfstream G550 and Bombardier's Global 6000. It is powered by the same engine types as the A320. The A319CJ was used by the Escadron de Transport, d'Entraînement et de Calibration which is in charge of transportation for France's officials and also by the Flugbereitschaft of the German Air Force for transportation of Germany's officials. An ACJ serves as a presidential or official aircraft of Armenia, Azerbaijan, Brazil, Bulgaria, Czech Republic, Germany, Italy, Malaysia, Slovakia, Thailand, Turkey, Ukraine, and Venezuela. The Airbus A318 is the smallest member of the Airbus A320 family. The A318 carries up to 132 passengers and has a maximum range of 3,100 nmi (5,700 km; 3,600 mi). The aircraft entered service in July 2003 with Frontier Airlines, and shares a common type rating with all other Airbus A320 family variants, allowing existing A320 family pilots to fly the aircraft without the need for further training. It is the largest commercial aircraft certified by the European Aviation Safety Agency for steep approach operations, allowing flights at airports such as London City Airport. Relative to other Airbus A320 family variants, the A318 has sold in only small numbers with total orders for only 80 aircraft placed as of 31 October 2015[update]. A programme to convert A320 and A321 aircraft into freighters was set up by Airbus Freighter Conversion GmbH. Airframes would be converted by EADS EFW in Dresden, Germany, and Zhukovsky, Russia. The launch customer AerCap signed a firm contract on 16 July 2008 to convert 30 of AerCap's passenger A320/A321s into A320/A321P2F (passenger to freighter). However, on 3 June 2011, Airbus announced all partners would end the passenger to freighter programme, citing high demand for used airframes for passenger service. On 17 June 2015, ST Aerospace, signed agreements with Airbus and EADS EFW for a collaboration to launch the A320/A321 passenger-to-freighter (P2F) conversion programme. As of 31 December 2017, 7,630 Airbus A320-family aircraft (all variants, including the A320neo family) remained in commercial service with over 330 airline operators. This includes 67 A318, 1,446 A319ceo, 4,270 A320ceo, 229 A320neo, 1,598 A321ceo and 20 A321neo aircraft. Air France, Avianca, and British Airways are the only operators to operate all four variants of the A320ceo family. By end of November 2018, the backlog fell to 193: 14 A319s, 85 A320s and 94 A321s; as Airbus delivered 213 A320ceo variants over the first 11 months of 2018 compared to 320 A320neo variants. By end of January 2019, the backlog fell further to 157: 10 A319s, 66 A320s and 81 A321s; as Airbus delivered 240 A320ceo variants in 2018 compared to 386 A320neo variants. Table does not include orders and deliveries of A320neo aircraft family. Data through end of March 2019. For the entire A320 family, 118 aviation accidents and incidents have occurred (the last one being Afriqiyah Airways Flight 209 on 23 December 2016), including 35 hull loss accidents (the last one being EgyptAir Flight 804 on 19 May 2016), and a total of 1393 fatalities (the last one aboard EgyptAir Flight 804 on 19 May 2016). On 26 June 1988, Air France Flight 296 crashed into trees at the end of runway at Mulhouse-Habsheim Airport, three out of 130 passengers were killed. In February 1990 another A320, Indian Airlines Flight 605, crash landed short of the airport runway in Bangalore, the ensuing fire contributed to the casualty count of ninety-two, out of 146 on board. The press and media later questioned the fly-by-wire flight control system but subsequent investigations by commission of inquiry found "no malfunction of the aircraft or its equipment which could have contributed towards a reduction in safety or an increase in the crew's workload during the final flight phase ... the response of the engines was normal and in compliance with certification requirement". It has seen fifty incidents where several flight displays were lost. Through 2015, the Airbus A320 family has experienced 0.12 fatal hull-loss accidents for every million takeoffs, and 0.26 total hull-loss accidents for every million takeoffs. This page is based on the Wikipedia article Airbus A320 family; it is used under the Creative Commons Attribution-ShareAlike 3.0 Unported License (CC-BY-SA). You may redistribute it, verbatim or modified, providing that you comply with the terms of the CC-BY-SA.